Seven-time Oscar nominated The Fighter is headed for Blu-ray Disc and DVD on March 15, 2011. The film will also be available On-Demand via your television service provider or online service. The Fighter was directed by David O. Russell (Three Kings) and stars Mark Wahlberg, Christian Bale, Melissa Leo, and Amy Adams. 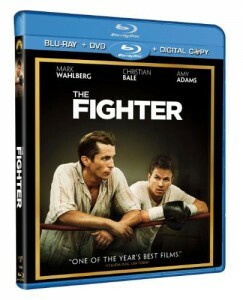 The Fighter on Blu-ray/DVD Combo with digital copy is now available for pre-order from Amazon.com. The BD is formatted in 1080p with a 1.85:1 widescreen aspect ratio and DTS-HD Master Audio. Extras include featurettes “The Warrior’s Code: Filming The Fighter,” and “Keeping The Faith,” as well as deleted scenes and commentaries from director David O. Russell. The Fighter is nominated for seven Academy Awards including Best Picture, Best Director, and Best Supporting Actor (Christian Bale). In the Best Picture category the film is contested by Black Swan, Inception, The Kids Are All Right, The King’s Speech, 127 Hours, The Social Network, Toy Story 3, True Grit, and Winter’s Bone. Let’s see if The Fighter can take home one those golden Oscars.